A woodcarver by trade, Ben started experimenting with occasional chewing-gum paintings in 1998, and in October 2004 began working on them full time. 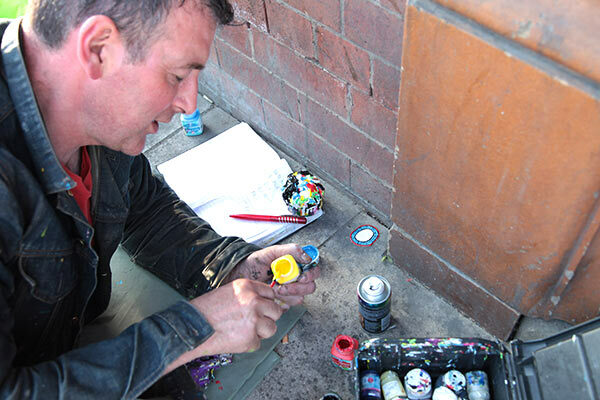 He has created more than 10,000 of these works on pavements across the UK and Europe. Most of his work is found in Muswell Hill, most recently creating a trail from St Paul’s to the Tate Modern across the Millennium Bridge in London. Always working in recycled art, his distaste for industrial waste, cars and rubbish has turned into an art form. Ben has also exhibited his paintings and sculptures in England, the United States, Germany, Ireland, Finland, France and Serbia. I am upset by all the garbage and sense of disconnectedness where people just affect things in a slightly detached way. When people detach from the environment, that’s when the environment gets destroyed and that’s also when people destroy each other.